Because spoon for spoon Froot Loops contains 20% less sugar and roughly 1/3 the calories as Special K granola. 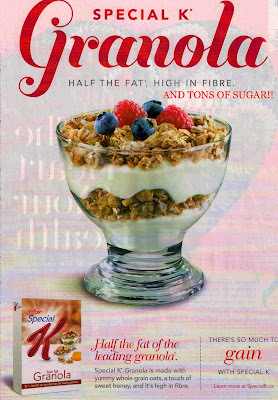 Yet here's betting the health halo of the words, "Granola", the claims, "Made with Whole Grains", "Low-Fat", and "Source of Fibre and Vitamin D", along with the weight-focused branding of "Special K", leads many to think this high calorie sugar bomb is a great, weight-safe, healthful meal or snack. If you're going to have a dessert cereal, best you know it's a treat and not think it's a health food.